This might have been the most pumpkinnish product we've had so far. Not in terms of ginger, allspice, and nutmeg—although "spices" were present in moderation—I'm talking about the actual large orange squash-like vegetable (or is it a fruit?). I felt like I was tasting pumpkin for the first time. And for those of you who've been reading this blog for a while, you'll know that it's definitely not my first time eating a pumpkin product. This soup had a very natural flavor. Similar to butternut squash soup in terms of taste, this dish was just creamy enough, flavorful enough, and spicy enough to not seem, well...weird. 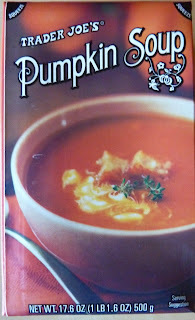 Unlike tomato soup, pea soup, and lentil soup, pumpkin soup was entirely unfamiliar to me up till now. And when I try something brand new to me, my biggest fear isn't really that it will taste bad. If it's simply unpalatable, I'll just steer clear of it next time. I'm most scared that it will taste so strange to me—that the flavor and texture will be so far outside my experience—that I'll somehow be unable to appreciate a perfectly good product because of my own personal shortcomings; my failure to expand my horizons wide enough to incorporate this unfamiliar substance into my realm of appreciation. Fortunately, neither of those scenarios was the case here. 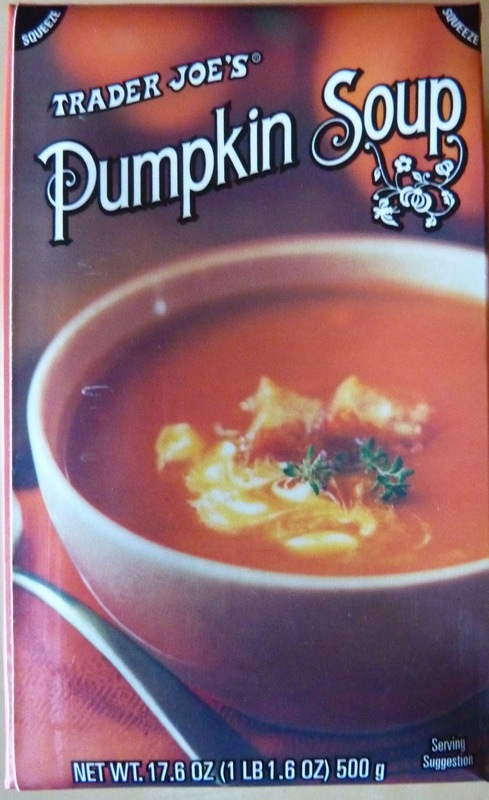 It was just really good soup that happened to taste like pumpkin. And Sonia and I were both appreciative of the fact that it's pre-mixed. There's no digging through the cupboards to find that measuring cup and then wondering whether you should use skim or whole, or whether you can substitute almond milk for cow's milk, or any of that nonsense. The mix was already done, and it just happened to be perfect. Plus, the box was less than $2. Our only complaint would be to point out that by itself, the soup is a bit boring. Some crackers or grilled cheese sandwiches are definitely in order if you want to turn this stuff into a meal, but happily, both crackers and grilled cheese complement this product perfectly. If you're averse to pumpkin or plain, creamy soups, this product ain't for you. But if you're on the fence about trying it, Sonia and I both think you should check it out. Double four's. If you ate it why didnt you take a photo so we can see texture, etc? Because this really actually does look like the picture on the packaging, minus the cheese or whatever in the middle. I sampled it at Trader Joes today. I liked it & bought it. It did taste very natural & the pumpkin flavor was so good. I did feel it was a bit plain tasting so I added cinnamon, honey, salt & sugar. It was so much better. I wish it was thicker though like a tomatoe bisque. I ate it along side sourdough toast & dipped...Yum!! Tasted like pumpkin bread.